Within bone malformations of the chest wall pectus that require surgical treatment, pectus excavatum is the one which arises more frequently, and the one which demands a major number of medical appointments and surgical interventions, due to the successful surgery results obtained with the present techniques at disposal, and the wish to improve one's physical image which is more and more instilled in our society. Given the especially practical and informative character we want this website to be, we will ignore commenting on specific aspects of the diagnosis and the treatment and, we will focus basically on the questions when and why children must be followed by the surgeon in order to study their treatment suitably. Pectus excavatum consists of the sternum's depression in varying degree of the ultimate costal cartilages towards the back of chest cavity. It is present in 0.05-0.1 of population, being more frequent among the white race rather than among orientals. It affects males in a 3:1 proportion in relation to females and it can manifest a relative incidence up to a 37% of the affected subjects. The defect can be proved either at the moment of birth or during the first year of life. However, its major expression is during first childhood and in growth spurts of prepubertal and pubertal stages. This anomaly can manifest itself in isolation or as part of a complex syndrome, which leads to an individualized strategical surgery. Marfan syndrome, recognized as a connective tissue upset of hereditary basis, is the one more frequently related to the most serious degrees of pectus excavatum. Therefore, medical investigations are always needed in order to detect the syndrome. Spinal column deviations, specially scoliosis, is usually associated to the syndrome as well. 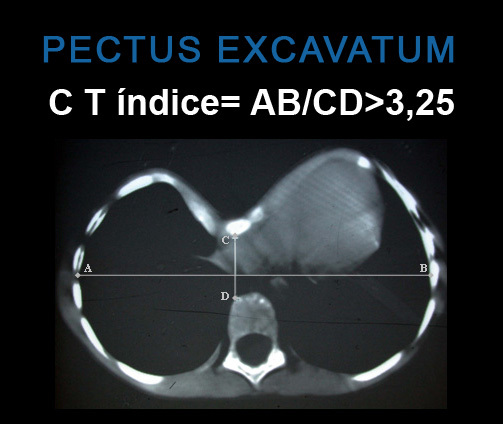 Pectus excavatum's cause is still unknown. Several hypotheses have been formulated to explain the upset. Intrauterine pressions, rickets or anomalies in diaphragmatic muscles have been supposed to be the cause. What is evident is the existence of a clear genetic load, since more than 30% of carriers have shown that they have family background. On the other hand, given the common relation of malformation to other muscular skeletal anomalies, like scoliosis (15%) and Marfan syndrome (5-8%), it seems that some anomaly in the connective tissue plays an important role in its aetiology. Alterations in enzymes responsible for metabolism of mucopolysaccharides and different trace elements such as Zn, Ca, Mg, probably of family's origin may be the producers of the debility of parasternal cartilages, which become deformed when mechanic factors derived from breathing and corporal growth have an impact upon them. Depending on the impact of these forces, deformity may turn into depressive or protussive. Nobody knowing why, the deformity acquires one shape or another at a specific stage of growth. Can it produce any symptoms? Only one third of pectus cases is present during the first childhood and for the rest it starts to be seen gradually as the child is growing, becoming more obvious in the prepuberty and puberty stages when an increase in the growth rate occurs. In our experience, malformation is commonly well tolerated since it hardly produces symptomatology up to 80% of the cases. Only those very severe pectus with established paradoxical breathing can present cardiorespiratory symptoms as a consequence of a decrease in the lung capacity, chest compression and deviation, or retraction of diaphragmatic movements. Bronchial disorders of repetition, throbbing, arrhytmia, murmurs and intolerance for physical exercise are the most frequent symbols. Normally, children visit the doctor for aesthetical reasons and psychological problems that derive from it. The affected avoid any kind of sport activity in which the deformity can be shown, like taking off one's T-shirt for swimming. This entails to become phisically undeveloped and shy. A special implication must be done for girls who suffer from Pectus excavatum. The symptomatology is the same as for the boys, but we should mention the future presence of the mammary gland, its development, form and contour. Frequently there exists a mammary hypoplasia mainly in the right gland. So, a surgery plan must be done taking into account the mammary development, a future prosthesis and scar positioning so that they will be concealed once the mammary development is completed. Which medical test is to be made facing the presence of a Pectus? In principle, asymptomatic patients with non-progressive stable deformity, slight or moderate, should be recommended to do aerobic exercises, swiming or cycling rather than strengthening muscle gymnastic exercises; they should be in an upright position and be evaluated yearly. It is necessary to carry out studies aimed at eliminating physical problems if the deformity is progressive and asymtomatic. This kind of studies may be: a thoratic CAT scan, pulmonary function test and heart evaluation including an ECG and echocardiogram. There are several methods to assess and monitor the deformity in view of indicating the operation objectively. The thoracic CAT is the widest used method, which not only supplies morphological and topographical thorax description, but also the possible anatomic and intrathoracic alterations. Haller index - the result obtained from dividing the thorax horizontal diameter in the CAT per the vertical one when it is superior to 3.25- establishes a surgery objective criterion. When is a pectus Excavatum to be operated? When the symptomatology is confirmed. Pulmonary function studies that show restriction or obstruction in the airway, or heart problems in the evaluation studies. Progressive increase of the deformity, although there are not any symptoms in the serial controls. Presence of important mental disorder. Aesthetic indication, either on a proposal from the parents or from the patient if he/she is of legal age. If positional changes in the spinal column exist as a consequence of the thoracic deformity. Haller's index in the CAT higher than 3.25 and cardiac compression evidence. Recurrence after previous surgery, either open or slightly invasive. The presence of two or more of these criteria base the surgical indication, although it takes as a base these points. Only less than 50% of the patients have a deformity serious enough in which a surgery operation will be required. The operation is not good for complex malformation symptoms in which surgery may suppose a danger for the child's life. This is the case of the prolapses and aortic aneurysm in the Marfan syndrome. The ideal age for the PE intervention is still a controversial issue. Historically, a large majority of paediatrician surgeons would recommend a prompt redress of the deformity for the symptomatic cases, because of its technical easiness, the prevention of the psychological aspects, and also for not being in school age yet. However, results show to be worse and relapses are more frequent in younger children. What is more, if much of deformed costal cartilage segment was dried out, there appeared that an upset of growth in the thoracic cavity was produced and it encompassed an important respiratory restriction. This is known as the acquired Jeune syndrome, or the acquired asphyxiating thoracic dystrophy. It appears in children which have been operated before 4, and suffer from a drying in a large part of the deformed cartilage in 5 or more ribs bilaterally. Due to these problems, surgery indication has been procrastinated to nearly the prepubertal or pubertal age, when possibilities of growth are decreasing. In the most serious cases of younger children with heart and respiratory problems, the Nuss minimally invasive technique is to be used - the open technique with limited cartilage resection and with stabilisation splint. There are few patients that need any of these procedures, and it happens frequently that surgeries are carried out between 8 and 10 years old of the patient. It is highly important to explain the parents thoroughfully all the details of the surgery, especially when we are dealing with asymptomatic patients with a considerable psychological burden. In these cases, it is advisable to wait that the patient him/herself together with his/her relatives take the decision of undergoing a surgery. Are there any non-surgical treatments for Pectus Excavatum? It is very difficult to stop the progressive growth of the deformity keeping conservative measures. When children are younger and endowed with more malleability of the skeletal system, it is very useful to carry out physical and postural exercises, although the kid's participation is very difficult to obtain. In the prepubertal and pubertal stages, a response to these measures is also void. However, swimming, postural exercises to keep the spine straight, arranging a figure-of-eight strap similar to the one used when there is a clavicle fracture, so that shoulders and chest wall are brought forward and, deep and prolonged respiratory exercises are measures which may succeed in stopping the defect's growth and in some cases it can even provoke an improvement. In the last years, we have seen the appearance of selective orthopaedic techniques suitable to the type of deformity. The results are good, but they entail having to hold an orthopaedic device that impedes the development of a normal life. Eckard Klobe's suction bell is the most recommended device – results are promising if one is tenacious using it during a long period of time.